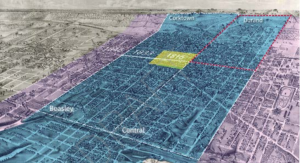 In 2013, ERA worked with the City of Hamilton on updating their Downtown Built Heritage Inventory (DBHI) project that reviewed 789 properties of architectural and historical value in an effort to understand the built heritage resources within the downtown core and how they contribute to Hamilton’s character. Survey and inventory methodology was designed to apply to the remaining 6000 properties in the city’s inventory and incorporated the use of historic context statements that aide in identifying properties that contribute to the unique qualities and character of a neighbourhood. The inventory has informed funding programs, provided context for designations and educated the public. 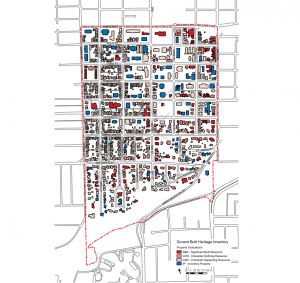 In a continuation of this process, Hamilton City Council recently approved ERA’s recommendations for the Durand Neighbourhood Inventory. The Durand neighbourhood is one of four original neighbourhoods included in the City’s 1833 incorporation, known for the depth and diversity of its population and heritage architecture. The innovation at the root of the project is a database the firm developed to sit at the core of all processes – it stores and links all key inventory information in the cloud, making it accessible throughout the project. Its capabilities facilitated survey work in the field using a tablet, data crunching in the office, and the production of rich visuals that helped describe our findings. Using our database, the collected historical and survey information integrated seamlessly with a geographic information system (GIS) dataset in order to capture, store, manipulate, analyze, manage and present spatial and geographic data. The end goal of the project was to provide recommendations for protecting heritage resources and managing growth within a changing urban context. The digital workflow allowed us to efficiently and thoughtfully survey the 1000+ properties within the study area, and leverage the database to analyze themes, trends and historical evidence. The final staff report, informed by our Durand Neighbourhood Inventory, was passed by Hamilton City Council on June 14, 2017 and included the addition of 736 addresses to the City’s Heritage Register, and 52 candidates to Heritage Staff’s designation work plan. ERA project ambassadors Victoria Angel, Mikael Sydor and Angela Garvey have written a paper on the project’s digital workflow, which they presented at the CIPA International Biennial Symposium in Ottawa this fall. The International Society for Photogrammetry and Remote Sensing has recently published their paper. For access to the published paper, click here.